People ask me all the time, “What is bonsai?” Today I’ll answer, “Camellia flower, falling, lets drop the rain of yesterday.” Ponder this wonderful haiku by Yosa Buson (1716–83), one of Japan’s great artists, and it may shed some light on the nature of bonsai. In fact, what is “planted” is not a plant at all. What is planted is essence, mood, and atmosphere. Bonsai is planting all of nature in a tray. It’s not just capturing what we see externally with our eyes but absorbing the spirit and vast, subtle nuances of nature. If one connects to bonsai through the heart, one can experience the essence of the natural world in a pot. The great Zen master Dogen Zenji (1200–53) once said that “the whole moon and the entire sky are reflected in dewdrops on the grass, even in one drop of water.” This imagery beautifully conveys how something as vast as the universe can be viewed in a single drop of dew. Similarly, bonsai seeks to transport the viewer’s heart to the core of nature. Bonsai, although small in size, can show the astute viewer vast expanses of landscape and limitless moments in time—past, present, and future. Though the aura of bonsai is strong on its own, it is only able to fully communicate this enormity of time and space with the participation of the viewer. A quiet language of imagery and emotion together with the viewer’s own life experience and imagination is the mirror upon which the bonsai reflects nature, both seen and unseen. Buson’s image of a camellia flower spilling rain as it falls from its stem puts into words what bonsai expresses without words: beautiful moments in time in the natural world. Bonsai can help us imagine the smell of wildflowers, the sounds of churning water in a river, and the feel of pine needles beneath our feet. Just as with haiku, bonsai encourages the viewer to conjure lovely small moments—say a foggy morning as a small insect lands on a rainladen camellia flower, creating just enough weight to finally make it drop. Bonsai allows us to be present in nature even in the middle of a bustling city. It is able to magnify nature’s spirit by helping the soul interpret and experience the mood of the landscape. Bonsai can pull people in and strum their heartstrings, but they do not grow into shape by themselves; this takes human artistry. A bonsai artist must master many horticultural and specific bonsai techniques in order to design a bonsai, but most important, he or she must first consider how to work in harmony with the bonsai to bring out the best potential in the plant. Countless shaping scenarios must all come together to make a believable design. At first this may seem overwhelming when attempting to style a bonsai. But having a clear understanding of the many different growing conditions a tree lives through in nature simplifies the choices made in the design process. Each “pre-bonsai” plant has inherent qualities in its form. The artist’s goal is to accentuate these features in such a way that the bonsai is comfortable in its shape. This then gives the bonsai tools to express an environmental mood. A famous bonsai master visiting from Japan, Seiji Morimae, once told me, “Before asking what a bonsai should be, one should consider what the bonsai asks of the grower.” This should be understood on many levels. People may think bonsai is about control, but it is exactly the opposite: It is embracing no control. To design bonsai well, one must let go of the desire to control in order to be able to see the soul of the tree and let that be the guide. Bonsai is not about restricting growth; it’s about redirecting growth. Special horticultural techniques are used to help redirect this growth, tailored to each individual bonsai. For example, shallow pots and customized potting soils are essential for a healthy root system. The bonsai root system consists only of very fine, fibrous roots. For these small roots to grow properly, the soil must be very fast draining and not too deep to prevent rot and allow for proper airflow. Soil ingredients must be mixed by hand to cater to the particular plant’s needs, and each tree has its own personal soil mix. Bonsai roots are not allowed to become pot bound, which would put the tree’s health in jeopardy. Every one to three years it is taken out of its pot, and the roots are lightly and precisely trimmed and some soil replaced. This root pruning, because it’s done on the fibrous roots, doesn’t hurt the plant. In fact, it spurs roots to increase and ramify (branch out), and as a denser system develops, the tree absorbs water and nutrients more efficiently. This makes the tree believe the root system is much larger than it really is, which in turn helps the tree feel secure in its environment and fosters a mature and stable root system. And the denser the root system, the denser the leaf canopy. A tree’s canopy is directly related to the root system, both in size and density. With ramified roots and branches, the treenaturally responds by growing smaller leaves. Where once one large leaf produced food there will be three or four smaller leaves producing food more efficiently. This kind of energy balancing is essential to bringing a bonsai to maturity, a process that takes place over decades of care. As it responds to these techniques over time, the bonsai slowly matures. The roots and canopy become balanced, and the tree harmonizes with its environment. It is only when the bonsai has reached this equilibrium that a change in its growth habit begins: The tree starts to grow and mature almost like a tree out in the landscape. Though small in scale, the tree’s balance of energy has it believing it is 30 feet tall. Youthful growth subsides in both the branches and roots, and the leaves grow in proportion to its small size. The internodes shorten, and shoot elongation decreases. This change in growth habit is a special time both for the bonsai and the grower. When these changes occur, it is a sign that the tree has reached a delicate balance and comfort. From this point forward the care routine changes, and everything done for the bonsai is to promote stability and maintain this balance. Maintaining the health and happiness of the tree is a grower’s first priority. Every bonsai is cared for individually with different techniques that depend on species, age, developmental phase, and individual growth habit. It can take a lifetime to learn to listen in their language and to perfect the care of mature trees. In nature, trees depend on each other and their environment for survival. Bonsai depend solely on us. When we learn to depend on them as well, both the artist and tree can grow healthily. With a tree or bonsai as a guide, there’s no limit to the depths of understanding one can achieve. I have found no better teacher. If a bonsai, a garden, a painting, or a person can show us the essence of life, it should be cherished and protected so that future generations may enjoy it. I am grateful to BBG that I have a small hand in that. 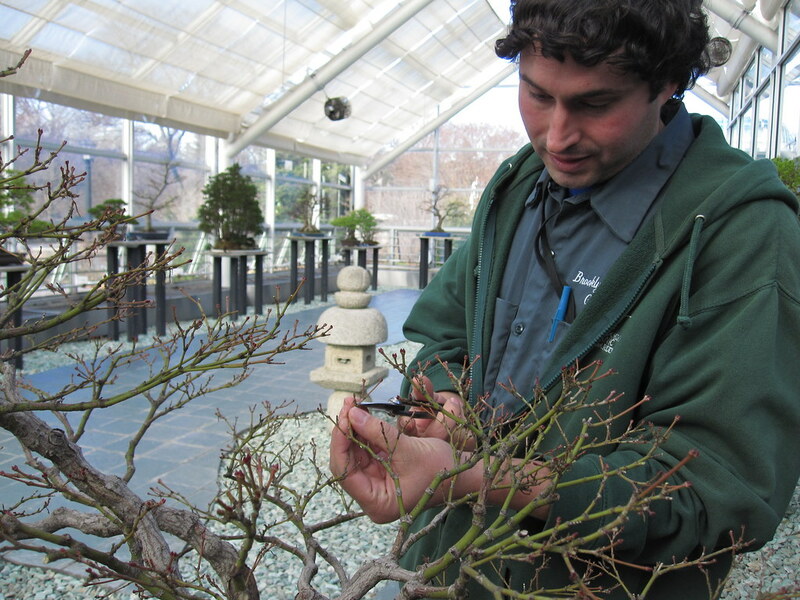 Julian Velasco is the curator of the bonsai collection and C.V. Starr Bonsai Museum. Julian Velasco, BBG’s bonsai curator. Photo by Rebecca Bullene.